Theater Companies Mark Odets Centennial Clifford Odets, remembered as the defining American playwright of the 1930s, would have turned 100 this year. His works -- including Waiting for Lefty, Awake and Sing and Golden Boy brought social realism to the stage. Many companies around the country are staging his plays. Clifford Odets, remembered as the defining American playwright of the 1930s, would have turned 100 this year. His works — including Waiting for Lefty, Awake and Sing and Golden Boy brought social realism to the stage. Many companies around the country are staging his plays. Clifford Odets was something of a Golden Boy himself on the American theater scene. This year marks the centennial of the birth of one of America's greatest playwrights. Clifford Odets made his name with plain, spoken depictions of life in Depression-era America. He wrote Waiting for Lefty, Awake and Sing, The Country Girl, and seven other full length plays. And he went on to a career as a Hollywood screenwriter. The Odets centennial is being celebrated by two major theatre companies. Tom Vitale reports. At Arena Stage in Washington, D.C., an ensemble cast is performing Awake and Sing, the 1935 Odets play about a family of Jewish immigrants in the Bronx struggling to maintain their dignity through the hardships of the Great Depression. The play opens with 21 year-old Ralph complaining about his job in a Lower East Side silk house. Mr. ADAM GREEN (as Ralph): You work like crazy. Do you think they'd see it? You drop dead first. Ms. ROBBINS (as Bessie): Rewarded you, 30 years a haberdashery clerk. Mr. GREEN (as Ralph): All I want is a chance to get to first base. Ms. ROBBINS (as Bessie): That's all? VITALE: The theme of self-fulfillment echoes throughout Odets's plays. On a public television program called Sum and Substance in the early 1960s, interviewer Herman Harvey asked Odets to sum up the central themes in his work. Mr. CLIFFORD ODETS (Playwright): I would want to talk about the fulfillment of each individual human being. About what in our American world develops all of the inherent possibilities of each man and woman and what holds them back. What stymies them. VITALE: The production of Odets' Awake and Sing at Arena Stage is directed by Zelda Fichandler. She returned to the company she founded in 1950 and ran for 40 years just to direct Odets. Ms. ZELDA FICHANDLER (Director and Founder, Arena Stage): At a time when Broadway was taken up with literate products from America and Europe, he came out with a patois, a language that was unique to him and affected all of the playwrights who came after. VITALE: Fichandler, who now runs the graduate acting program at New York University, says Odets is a seminal figure in the American theatre for two reasons: the gallery of working class characters he put on American stages for the first time, and his passionate, original language. Ms. FICHANDLER: Some say David Mamet is an inheritor of his language, or even Arthur Miller. It's a language that is quote "realistic," that you can believe people are saying it, but people don't actually talk in the images and metaphors of Clifford Odets. It's very explosive, very personal, very imagistic. It's wonderful poetry. Mr. GREEN (as Ralph): I don't know. Every other day they sit around with the blues and mud in your mouth. Mr. ROUTMAN (as Myron): Well that's how it is, life is like that, a cake walk. Mr. GREEN (as Ralph): What's it get you? Ms. ROBBINS (as Bessie): A four car funeral. Mr. GREEN (as Ralph): What's it for? Mr. ROBERT PROSKY (as Jacob): What's it for? If this life leads to a revolution, it's a good life. Otherwise, it's for nothing. Ms. ROBBINS (as Bessie): Never mind, Pa, pass me the salt. VITALE: Awake and Sing was Clifford Odets's first play. He wrote it when he was 28 years old, after becoming an original member of the Group Theatre in New York as an actor. The socially progressive troupe, which included Lee Strasburg and Harold Clurman, was committed to staging works that would address the issues of the day, and Clifford Odets was its star. His plays were hits. They included Waiting for Lefty, about a taxi driver strike, and Golden Boy, about a boxer torn between his lucrative career in the ring and his passion for the violin. Odets made the cover of Time magazine in 1938. Actor Ben Gazzara joined the Actors Studio, an offshoot of the Group Theatre, a decade later. He auditioned with a scene from the Odets play, Night Music. Mr. BEN GAZZARA (Actor): He's my father. Without him, I wouldn't be here. I mean, without him, there wouldn't have been a Group Theatre. Without a Group Theatre there wouldn't have been an Actors Studio, without an Actors Studio, there wouldn't have been me. So I owe him a lot. VITALE: Judging from the Upper East Side Manhattan neighborhood where Gazzara lives, he does owe a lot to Odets. Now Gazzara is set play the role of the Socialist grandfather Jake in the Lincoln Center production of Awake and Sing, which opens in April. In the current Arena stage run, Jake is played by veteran actor Robert Prosky. Mr. ROBERT PROSKY (as Jake): (Unintelligible) Be something. Make your life something good for the love an old man who sees in your young days there's new life and such love. Take the world in your two hands, make it like new. Go out and fight. So life shouldn't be printed on dollar bills. VITALE: The work of Clifford Odets ranks alongside that of Tennessee Williams and Eugene O'Neill, says Ben Gazzara. He says Odets's play should be staged more often. Mr. GAZZARA: Some people might think they're dated, because at their core, they deal with a time in our lives, the Depression usually. Money is an issue. The struggle to make ends meet is an issue. But I think it's time to remind us again. You got people out of work, you got people in desperation, you got people who don't know what to do. These people are trying to hang on to dignity despite everything that tries to tear it away. VITALE: Clifford Odets wrote from personal experience. He was born in Philadelphia on July 18th, 1906, to poor immigrant parents. His family moved to the Bronx, where his father eventually became a successful printer. But Odets questioned the values of his family which equated success with material gain. When he was 17, he dropped out of high school to become an actor. After his own success as a Broadway playwright, Odets left the Group Theatre in 1941 to write for Hollywood. In 20 years he wrote just a handful of screenplays, including Deadline at Dawn and Sweet Smell of Success. He also contributed uncredited dialogue to Hitchcock's Notorious and Frank Capra's It's a Wonderful Life, a story that certainly shared his concerns. Mr. JIMMY STEWART (as George Bailey in It's a Wonderful Life): Do you know how long it takes a working man to save 5,000 dollars? Just remember this, Mr. Potter, that this rabble you're talking about, they do most of the working and paying and living and dying in this community. Well, is it too much to have them work and pay and live and die in a couple of decent rooms and a bath? VITALE: Odets' early years as a Hollywood screenwriter are the basis for the Coen Brother's 1991 film, Barton Fink, in which the title character is tempted to make a deal with the devil. Ben Gazzara says Clifford Odets wasted his talents in Hollywood and that Odets faced the same struggle as many of his characters. Mr. GAZZARA: Between art and commerce, there's always that battle, you know, the same battle in Golden Boy, the same battle this boy Ralph has in Awake and Sing. I think he died because of that struggle. The Hollywood thing was no good for him. He wanted to be a Hollywood success story and I think he gave his soul. VITALE: Odets himself told interviewer Herman Harvey that he was accused of selling out. Mr. ODETS: The moment I come out to Hollywood to stay here for one picture or four pictures, it is considered, generally, that I have prostituted myself. All my talents. VITALE: But Odets went on to insist that he never compromised the way so many other Americans felt they had to. Despite the fact that he testified for the House Committee on Un-American Activities about his youthful membership in the Communist Party and he identified some of his fellow travelers. MR. ODETS: In how many cases does a man's job depend upon, you know, mind your business, keep your nose clean. It reminds me of a story about a school teacher who was called up before a local school board and wanted the job very badly. And they kind of looked him over and said, Well, suppose you tell us, Mr. Jones, what about the world, is it round or is it flat? And Mr. Jones said, Well, gentleman, I can teach it either way. There's too much of that in this country today. VITALE: Although Odets was a life-long critic of American society, the underlying message of much of his work was one of optimism. Mr. GREEN (as Ralph): Did Jake die for us to fight about nickels? No. Awake and sing, he said. Right here he stood and said it. So the night he died, I saw it like a thunderbolt. I saw he was dead and I was born. I swear to God, I'm one week old and I want the whole city to hear it. 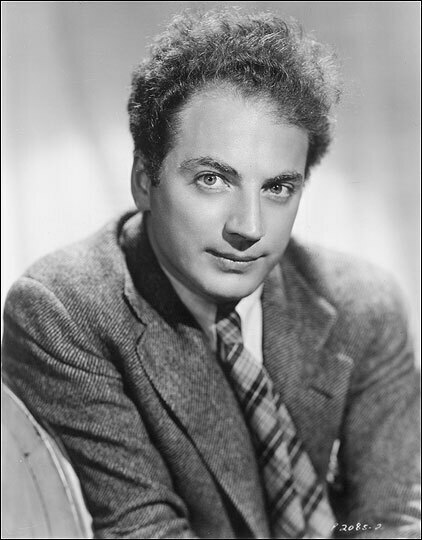 VITALE: Clifford Odets died of cancer at the age of 57 on August 18th, 1963. For NPR News, I'm Tom Vitale in New York. ELLIOTT: That's ALL THINGS CONSIDERED, from NPR News, I'm Debbie Elliott.